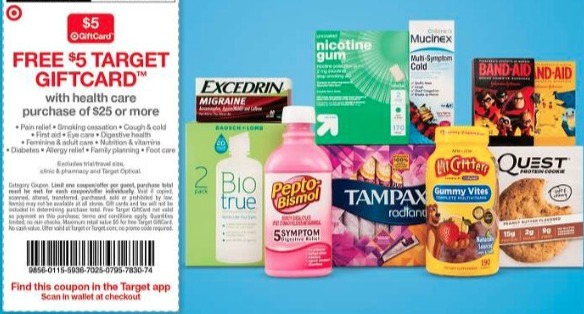 There is a new in-ad coupon starting Sunday at Target off the entire health department. Grab $25 worth of products (before any coupons) and you’ll get a $5 Target gift card back at the register. The sweet part, is you can still add on the coupons and pay a lot less than $25 for it all! You’ll find the store coupon in the Target Weekly Ad tomorrow or in the Target App under the wallet section. Check out all the deals in the Target list and bring the coupons with you!